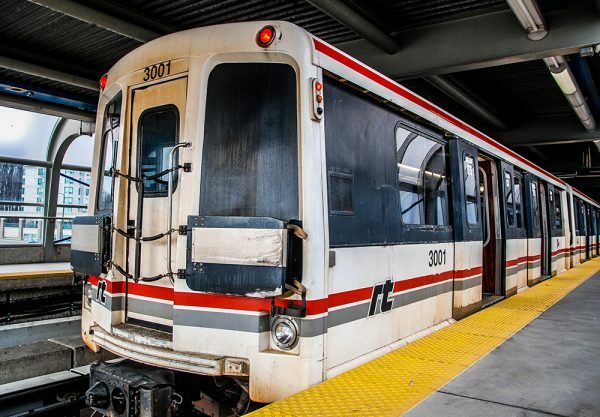 The Scarborough RT is a six-stop line that begins on McCowan Avenue and ends at the platform on top of Kennedy Station. 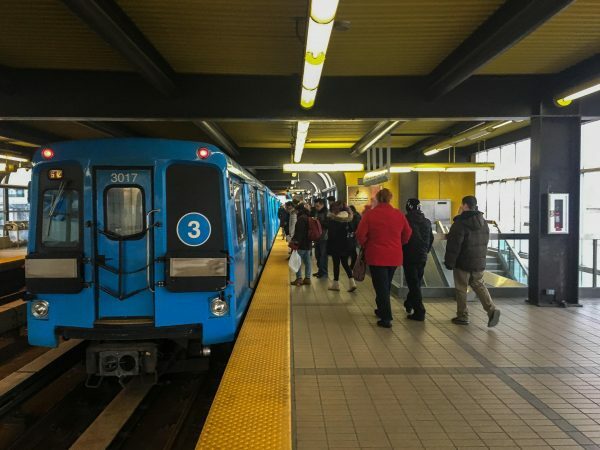 If the current City of Toronto plan sticks, all of these stations will be demolished and replaced by a one-stop extension of the Bloor subway line connecting Kennedy Station to Scarborough Town Centre. Line 3, as it is officially called, opened in 1985. My first ride on the RT was in 1990 when I was 10 years old and had just moved to Scarborough, joining the majority of my extended family. Though the line was only five years old at that point, my early memory of the RT isn’t of something shiny and new. The curved glass windows set in metal frames that make up the facade of each station had what felt like a futuristic look to them. 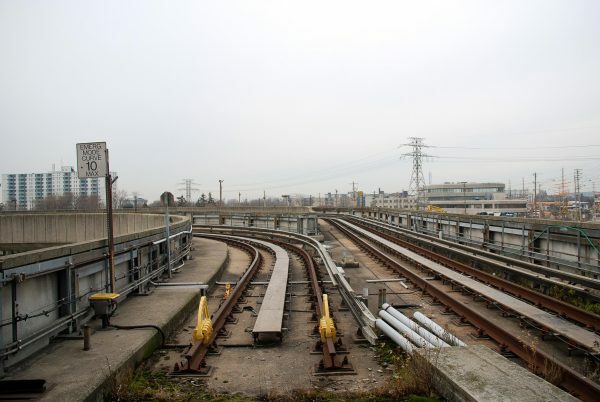 However, the bulky grey concrete making up the majority of the line gave it an aged feel, like an under-funded attempt at designing the transit of the future. 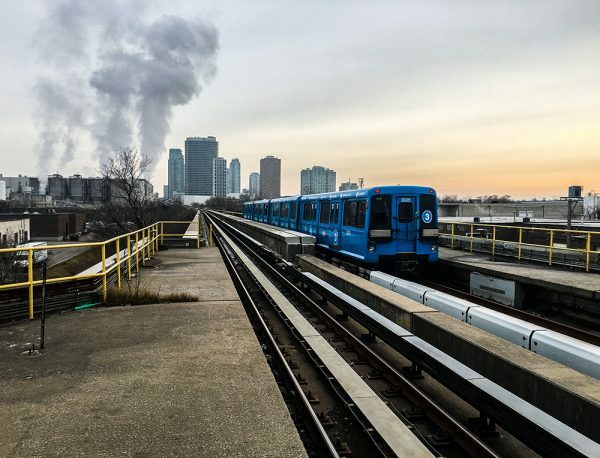 The trains used to be white, red and grey, but are now a bright blue. You can still find the odd original car on the line. For posterity, I took a ride on the RT with a camera one Saturday morning, getting off at each stop to spend some time in and around all six stations. I started at McCowan and headed south-west towards Kennedy. 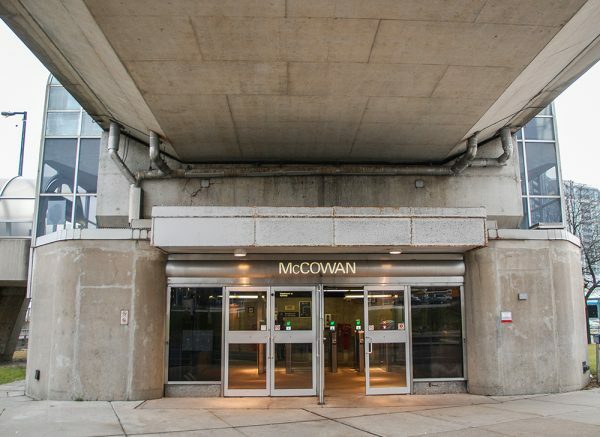 McCowan Station is the eastern end of the line. It is within a lonely suburban walking distance of an industrial area and an enclave condos. From the station, you can see the complex of Scarborough Town Centre, Scarborough Civic Centre, and the YMCA. You take the tall stairs up from street level to the platform that rises to the track crossing over the street below. Most of the trains you catch at this station have just finished their eastbound route, and are on their way back west. Sometimes you will catch a train leaving from the train yard that sits beyond visibility. 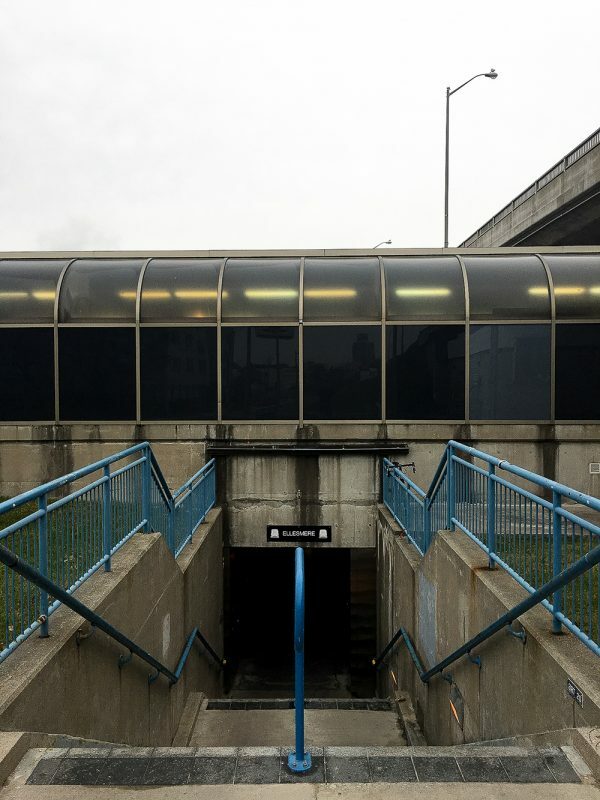 The ride to the next stop, Scarborough Town Centre, is the shortest on the route – it’s over just as it started. For most riders of the RT, this is where the line begins and ends. The mall, a village of condos, the Civic Centre, a hub of TTC buses that spread like tentacles through Scarborough, and connections to GO buses make this one of the busiest of the stations. The next stop is Midland, and is the most picturesque, if one has an eye for finding beauty amidst the industrial. Approaching the station from Town Centre, you pass rows of factories with their smoke stacks bellowing smoke and fumes. Set beside a waterway and a recycling plant, I have always been fascinated with being able to look out the window and see a fortress of compressed cardboard. It is the only station where the platform stretches over the road like a bridge. While up there waiting for the train, you can gaze at the cars passing below. Leaving Midland station, looking out of the windows to the south was an obsession of mine growing up. The back alleys of the warehouses and factories were (and still are) covered in graffiti murals. Wall after wall, it was the closest we got to touching this art form that we loved and admired. New pieces, painted-over pieces, crossed-out pieces, and pieces that nobody touched. ?Every single time I rode the RT growing up, my eyes (and those of any friends I was with) would stay searching for and soaking in every mural and tag we could spot on the walls and fences along the route. I still do that. On the way to Ellesmere station, there is a dip down and a curve that brings you through a dark tunnel. 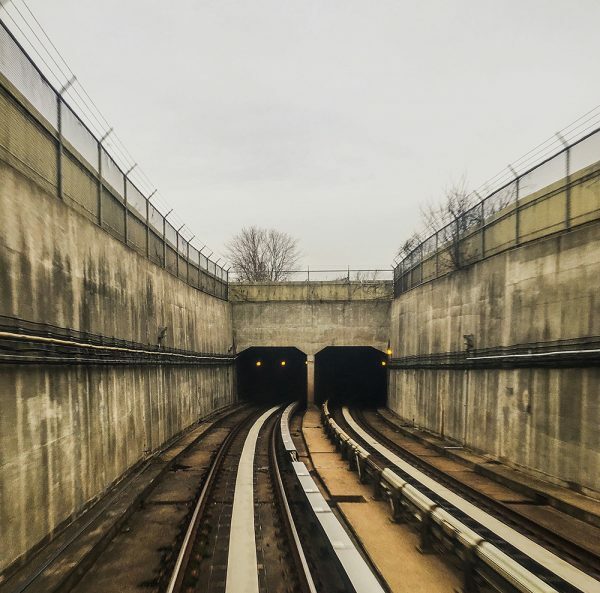 The moment you emerge from the tunnel, you are slowing down to enter the station. Set under a huge bridge, Ellesmere station is both the strangest and most inaccessible on the line. No matter where you are coming from, getting to and from this station is inconvenient. 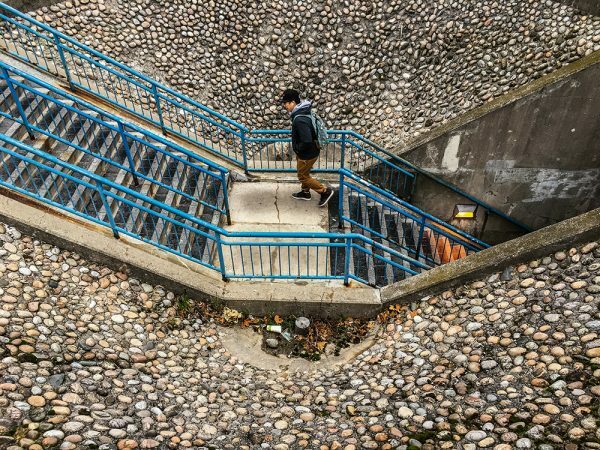 And though the tracks are at ground level, you have to descend down a deep set of stairs into a cave-like space filled with turn-styles and a single collector booth, only to climb back up a steep set of stairs up to the platform.? This station contains an important key to the Scarborough subway debate. 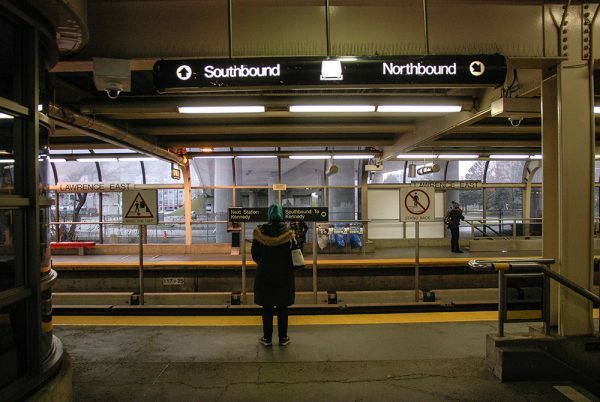 Approximately 70% of the trips on the RT are said to be between Scarborough Town Centre and Kennedy Station, a stat that offers comfort to those behind the idea of a one-stop subway. Of the remaining 30% spread among all of the other stations, very little of that happens at Ellesmere Station – it is like a single room in a home that can only be accessed from the outside, the trouble in getting there quite often isn’t worth the hassle. Yet, poor local access is better than no local access. A line that eliminates all of these connection points only makes sense through a mindset that sees Scarborough without nuance; as a homogeneous borough, rather than a collection of neighbourhoods. The ride to Lawrence Station finishes with a slow approach to an iconic mural with the words “East Side” wrapped in barbed-wire, surrounded by cartoon faces of a skull, a cop, and a pale figure with an ice-pic. ?Getting to Lawrence also felt good; it meant you have one more stop until you reach the subway. Lawrence Station, like Ellesmere, sits under a bridge. However, you can walk straight through the collector booth to catch the train. Where there are stairs to climb down then up again, it makes sense. 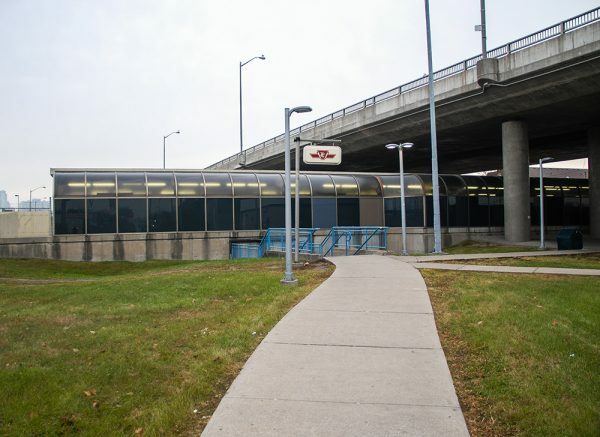 It is also one of three stations on the line that has a bus loop (the others being Kennedy and Scarborough Town Centre). ?The platform hosting the 54 Lawrence bus makes this station much easier to get to. 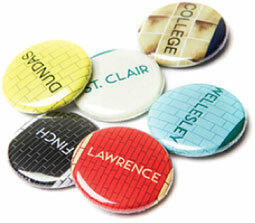 Lawrence has always been one of my favourites — it feels like Scarborough more than any of the others to me?because of the people who have the most cause to use it. Where Scarborough Town Centre and Kennedy Station are busy with people from all over the city (including Scarborough), and the other stations on the line feel quite desolate, Lawrence is buzzing with people living and working in Scarborough, but otherwise, there is little reason to be at Lawrence East Station. 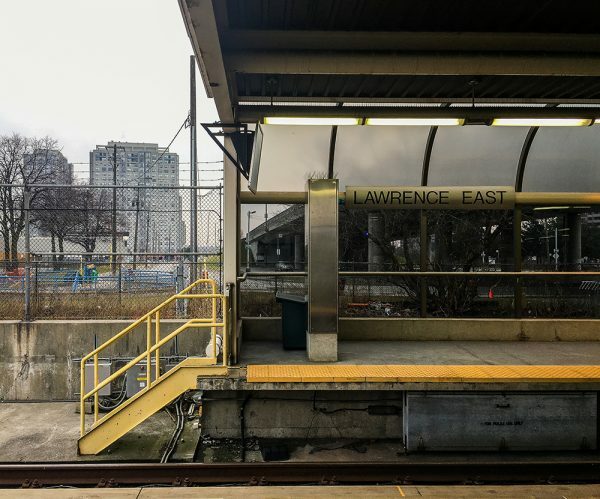 While not perfect, Lawrence East speaks to the potential of an RT station that can be accessed by foot and bus. If you moved Lawrence East from the bridge it sits under to Lawrence and Midland, it would be even more utilized. 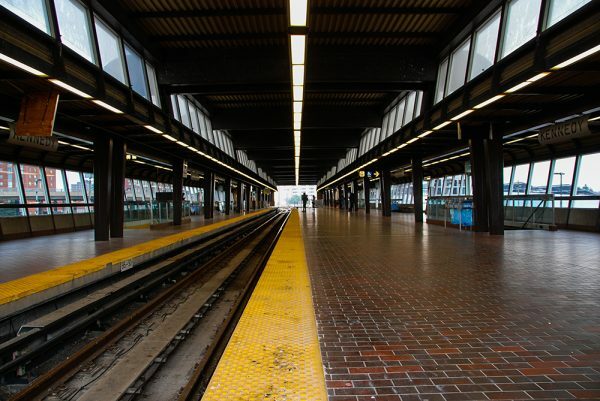 Place Ellesmere Station a few hundred metres to the west at Kennedy, and it becomes a transit hub. Move Midland Station from the heart of an industrial area to Ellesmere and it comes to life in new ways. 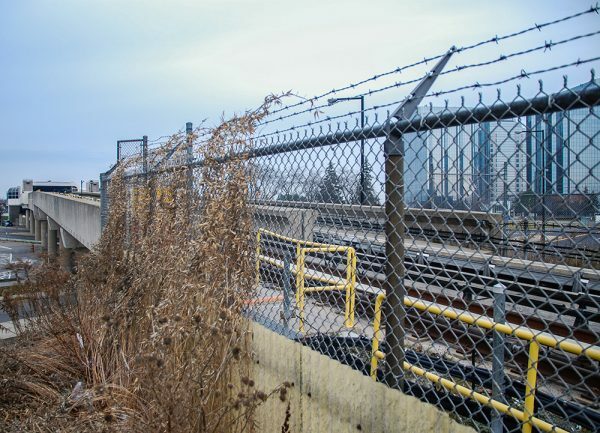 Place McCowan Station on Sheppard, and you have given a huge section of Scarborough direct access to the RT. Once you leave Lawrence, you are on your way to the end of the line. 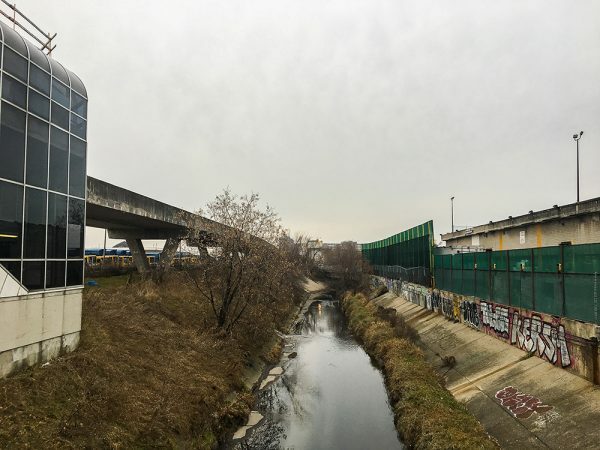 You cut through rows of backyards and porches behind bungalows until you reach the condos, the Eglinton bridge and the hockey arena that neighbour Kennedy station. You take a final sharp turn into the Kennedy station platform, the widest of all of the stations. 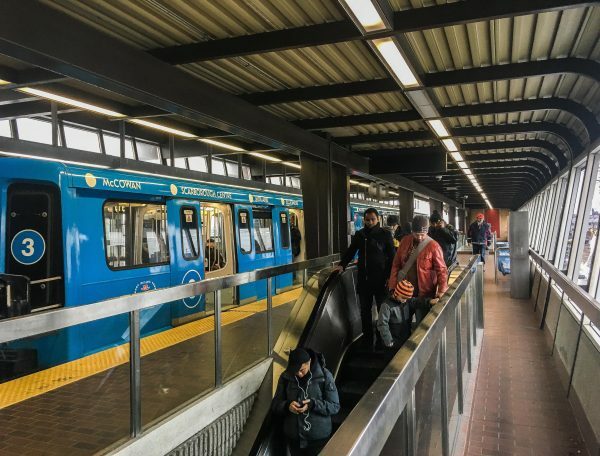 The train empties and people file into one the stairways or escalators, down to the hub of buses, or even deeper onto the subway platform. For most, this is where Scarborough ends and begins. For me, the RT was the way my downtown – whether going with friends to the Play De Record, or spending time exploring the city with my Dad and my brother. Once I got into high school and I started making friends in other parts of Scarborough, the RT brought me into pockets of the borough that I used to pass by as just a stop on the line. I know much of the warmth I hold for the RT is nostalgia. 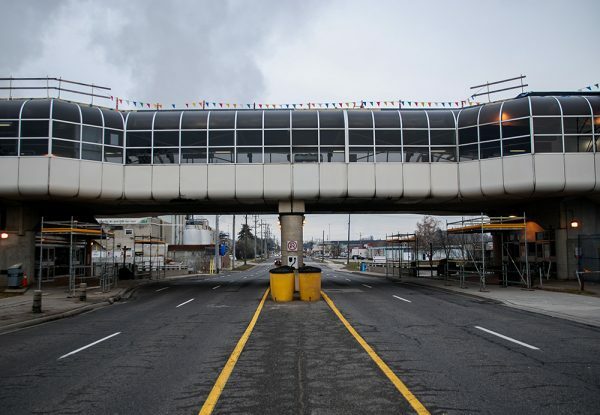 ?It is inefficient, ineffective, and poorly planned, yet?the memories it holds and connections it provides to the other parts of the city were integral to growing up in the east end. 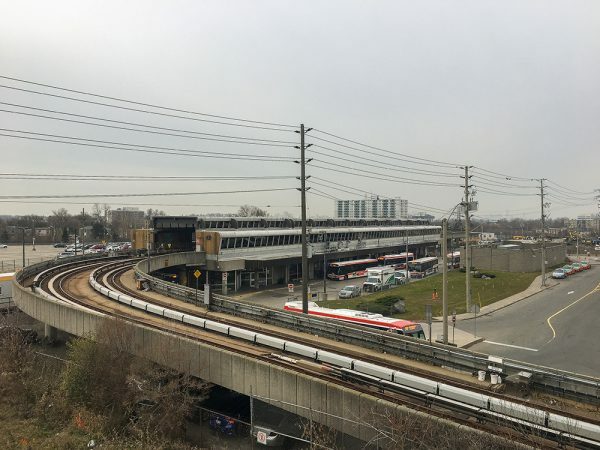 It’s knowing what those connecting points meant to me, and people in the east end, that fuels my hope that the future of transit in Scarborough is one that connects our neighbourhoods, rather than one that cuts through them. 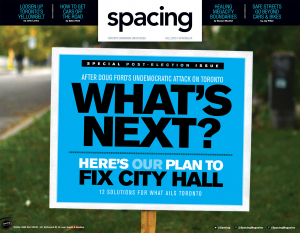 I imagine subtle shifting of the dots and stretching of that short blue line in the upper right corner of our transit map turning a line of Scarborough stations into hubs that open-up the places people walk, work, and live. 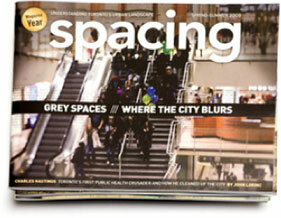 EVENT: Spacing launches short fiction book "Toronto 2033"